Mariah joined the IU Health Physician and Advanced Provider Recruitment team in 2018. After graduating from Indiana State University, in Terre Haute, Indiana she began her career at Indiana University Health as Recruiting Specialist for the Talent Acquisition Team. While there, she gained experience in supporting full-cycle recruiting for a variety of clinical and non-clinical positions. 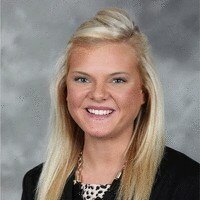 She enjoys sharing IU Health’s values with candidates and helping contribute to the success of the company. “I found my passion in recruiting when I realized you are not only able to indirectly positively affect patients’ lives, but positively affect candidates’ lives by ensuring they have a good experience with the recruitment process”. Fun Fact: Enjoys section hiking the Appalachian Trail.